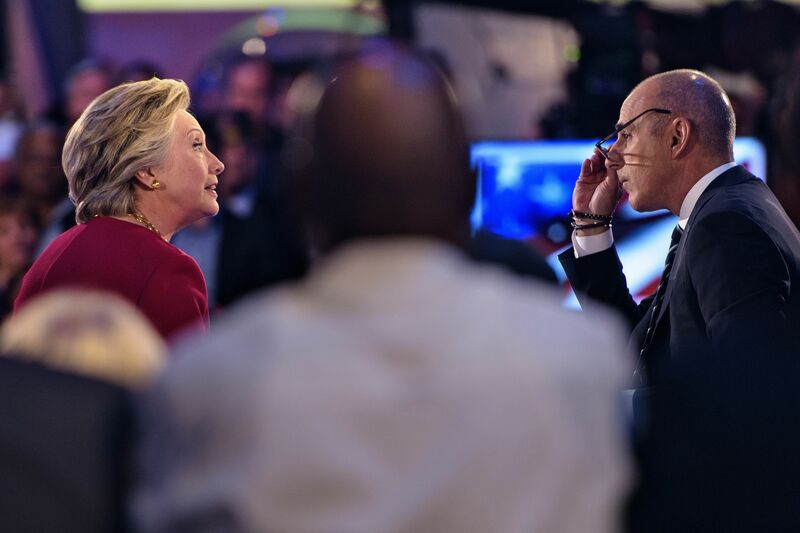 Following Wednesday night's Commander in Chief forum on NBC, Matt Lauer has faced criticism for his handling of his interviews with presidential candidates Hillary Clinton and Donald Trump. The criticisms waged against him included what appeared to be a reticence to fact-check Trump after the Republican candidate claimed he opposed the Iraq War from the beginning. Many also noticed and were perturbed by Lauer's treatment of Clinton, which included interrupting her and at one point instructing the former secretary of state to answer a question "as briefly as you can" — the question was about how she would beat ISIS as president and, thus, did not exactly lend itself to brevity. In my eyes, last night's forum with Lauer epitomized the double-standard in the ways Clinton and Trump are allowed to publicly speak. Lauer's moderation style unfortunately accurately reflects the way the election process has always held Clinton under higher scrutiny in debates than her male peers. Back in March, during a CNN debate in Michigan, when Clinton attempted to interject her thoughts about the 2008 Wall Street bailout, her opponent, Vermont Sen. Bernie Sanders, simply shut her down by saying, "Excuse me, I'm talking." While this anecdote may sound innocuous in isolation, the comfort with which he demanded Clinton silence herself contributes to the larger culture of debate sexism. The gap of sexist double-standards between the candidates is only emphasized by the consistent sensationalism of Trump, who at his campaign launch in New York said of Mexican immigrants, "They’re bringing drugs, they’re bringing crime, they’re rapists." Not only has Trump managed to build a campaign while making such statements, he's had the gall to demand an apology from the New York Times after a representative for the publication criticized him for appearing to mock one of their reporters who has a disability. Meanwhile, Clinton's speaking style itself has been described as shrill, and she is criticized for not smiling enough. Even Wednesday night, Republican National Committee Chair Reince Priebus tweeted that Clinton was "angry + defensive the entire time - no smile and uncomfortable." Really? We're going to focus on not smiling enough when her opponent is denying the truth about how he felt about the war in Iraq on national television. This critique from Priebus may sound familiar. Clinton was also criticized for not smiling enough when she accepted the Democratic Presidential nomination in August. As we move forward in the last few months of the election, the question remains: Will the chasm between Trump's over-the-top antics and the potent double-standards against Clinton only continue to grow when they face each other in the debates? We'll find out at the first one in just a few weeks on Sept. 26.